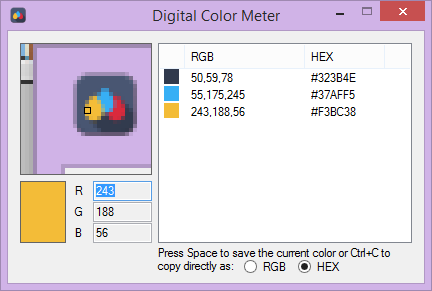 Is there a Windows PC equivalent to the OS X DigitalColor Meter? 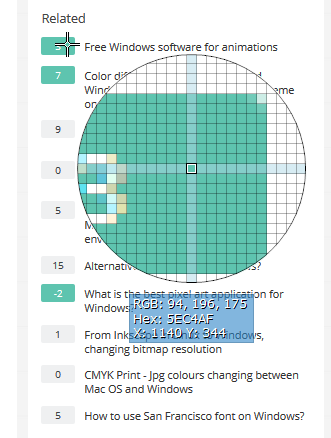 Is there a Windows PC equivalent to the color picker app found on Mac OS X called DigitalColor Meter? I use ShareX (which is free and Open Source) as a screen grabber, it also has a "screen colour picker" in the Tools menu. It's quite nice because you can colour pick individual pixels. I've just discovered this project which seems simple and just works. Hit the Spacebar to save the current color or Ctrl+C to copy it directly as either HEX or RGB. If you want to avoid installing anything, you can use Microsoft Paint. You can open a saved image in MS Paint, click the color picker (looks like an eye dropper), and click the part of the image you want the color for. Then go to Edit colors and you can see the RGB or Hue/Saturation/Lum. values. If the color you want is not already saved as an image, you can use the built-in Snipping screenshot utility, then follow the steps above. MS Paint enables zooming, so you can get down to the pixel you want. Not the answer you're looking for? Browse other questions tagged color software-recommendation windows or ask your own question. Color differences between Mac and Windows, How to set color profile scheme on Windows to get same colors of Mac? Is there a tool to extract colors at regular intervals along a curve or line? What are some of the benefits of having a Mac vs a Windows PC in a design environment? Alternative for Sketch on Windows? How can I replicate Photoshop's content-aware fill in Gimp for Windows? What are the Windows 10 top bar icon guidelines?